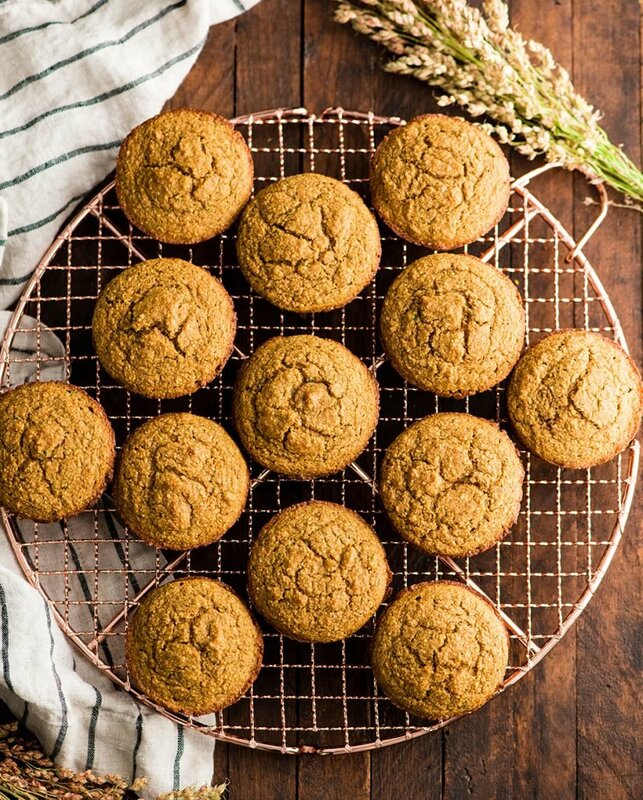 These Carrot Zucchini Muffins are made with whole wheat flour and oatmeal! They are the perfect healthy breakfast recipe that’s loaded with nutrition! AKA: Baby Muffins! This post is sponsored by World Vision. As always, all opinions are my own. Today, I have a very special blog post for all of you. 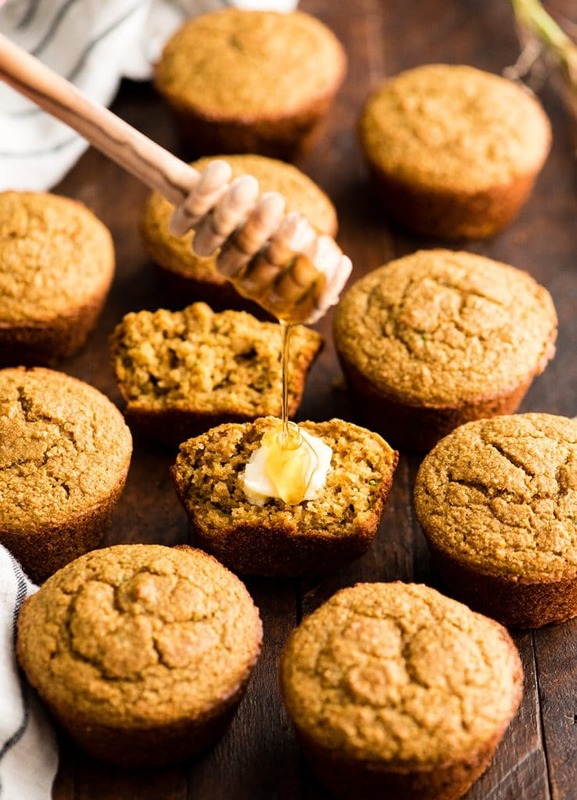 Not only does it include the recipe for these healthy Carrot Zucchini Muffins, but I will also be sharing a little bit about World Vision and ways that you can make a difference in the lives of children and families around the world! It’s no secret that my mission here on JoyFoodSunshine is to show all of you that maintaining a healthy lifestyle while raising kids is attainable, delicious and fun. Well, these Carrot Zucchini Oatmeal Muffins were the very first baked goods I ever made for Bethany. 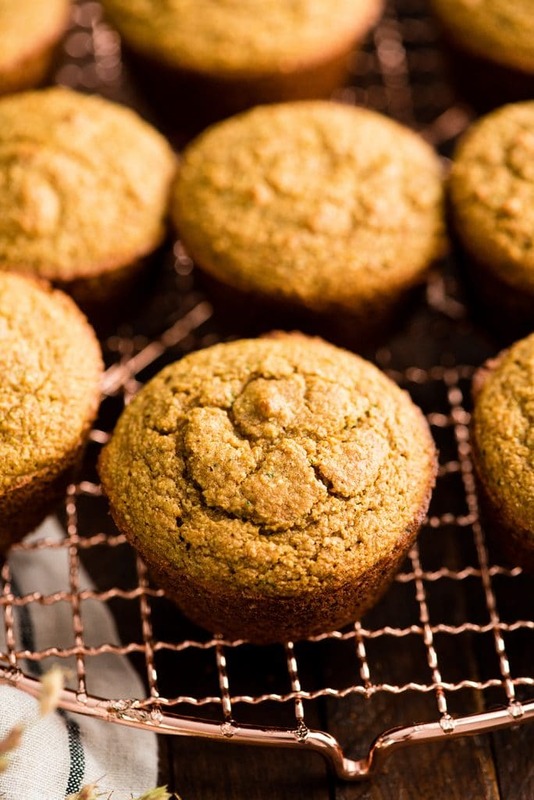 These carrot zucchini muffins are a great breakfast to feed our children (and ourselves). They are packed full of vegetables, fiber, protein and nutrients so they keep us full all throughout the morning! I also love this carrot zucchini muffin recipe because it is not too sweet! Which leaves plenty of room to add a drizzle of honey or a dollop of nut butter to add to your morning breakfast enjoyment! Much like the main focus of JoyFoodSunshine, World Vision has a program called Common Pot, which works with mothers in local communities to train and teach them how to best nourish their children. As moms, we try to teach our kids how to choose healthy and nutritious foods for their cute little growing bodies! But what if you and I didn’t have access to such knowledge? What if we didn’t know how to go about feeding our children healthy meals? What if, when our children failed to thrive, we didn’t know how to fix it or who to turn to for help?! That’s why World Vision develops nutritional and cooking training for parents using fruits and vegetables that can be grown in their very own gardens (like these Carrot Zucchini Muffins)! So how can YOU and I help World Vision and children all over the world?! By sponsoring a child! For only $39/month you will not only help the child you sponsor, but an entire community full of families who need help. Your donations go towards helping World Vision create long-term, sustainable plans to keep the communities out of poverty, even once they have moved on to help other communities. It’s the classic “teach-a-man-to-fish” philosophy! Sponsor a Child for the holiday season. Ok, did you know there are only 14 more Saturdays until Christmas?! My kids are already talking about what they would like to receive, which we try to avoid (as much as we can). We teach our kids that Christmas is Jesus’ birthday. And that we should be more excited to give during the season celebrating God’s eternal gift to us, than to receive temporary possessions that will likely break within the year. 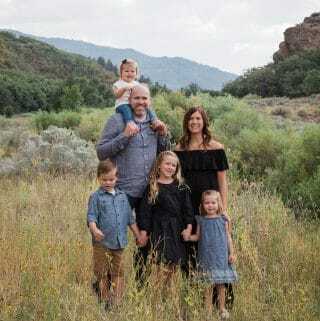 What better way to teach your child the beauty of giving than by sponsoring a child who is truly in need (as opposed to “needing” that new lego set, lol)! If you sponsor a child now, you should receive your first letter from that child before Christmas! 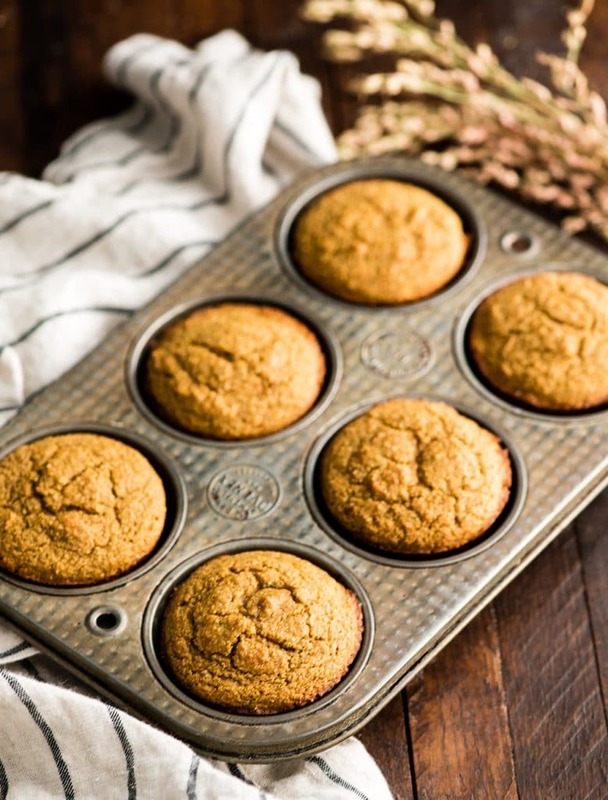 So, in tandem with World Vision’s Common Pot program, I’m going to discuss how to make these delicious Carrot Zucchini Muffins to nourish our children, and I will also share a few tips that we use with our kids to encourage healthy eating habits! How do you make Carrot Zucchini Muffins? These Carrot Zucchini Muffins are really simple to make! But as always, let’s walk through the steps together! Use a food processor fitted with an “S” blade or a high-powered blender (like a Vitamix), to process the zucchini and carrots until they are finely shredded (see middle picture below). This will ensure that the veggies will do two things. 1) they will add moisture to your carrot zucchini muffins, and 2) they will be undetectable to your picky little eaters! Remember, there are two more processing steps in this recipe, so the veggies will become even more finely processed as you go! Step 2: Add the wet ingredients and process again! After the veggies are finely processed, add the rest of the wet ingredients and process some more, until the mixture is smooth and uniform throughout. Note: Using a high-powered blender in place of a food processor will result in a more silky smooth wet mixture. Step 3: Add dry ingredients and process some more! Once the wet mixture is smooth and homogenous (uniform throughout), add the dry ingredients and process until everything is fully combined! Step 4: Let the batter rest. In order to ensure that the dry ingredients soak in all the moisture that they can, let it rest for about 5 minutes! It will thicken as it rests, making it easier to scoop into the muffin tin (which just so happens to be the next step…). Optional: At this point you could add mix-ins like chocolate chips, nuts, seeds, dried fruits, etc. Step 5: Scoop & Bake! Use a 1/4 cup measuring cup to scoop the batter into a prepared muffin tin that has been well greased! I don’t recommend using liners! If you grease your pan well the muffins are very easy to remove! Bake until the muffins are set, slightly brown around the edges, and the tops spring back when touched! You can also test for doneness by inserting a toothpick into the center of a muffin, if it comes out clean, they’re done! Let the muffins cool in the muffin tin for about 5 minutes after baking. After that time, use a spoon or knife to loosen the edges. Then remove the muffins from the baking tin and transfer them to a cooling rack to cool completely! Serve these Carrot Zucchini Muffins with a dollop of nut butter and a drizzle of honey! My kids also enjoy them with a pat of butter and a sprinkle of cinnamon sugar! Or just eat them plain! How do you freeze Carrot Zucchini Muffins? To freeze these Carrot Zucchini Muffins simply let them cool fully to room temperature. Then put them in an airtight container in the freezer! To Reheat: Place frozen muffins in the microwave and warm for about 45 seconds per muffin! 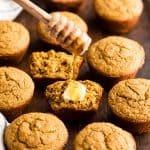 As always, let’s chat about some of the ingredients in this carrot zucchini muffin recipe, and possible substitutions. Whole wheat flour. I have used all of the following substitutions with great results: all-purpose flour, white whole wheat flour, and a 1:1 gluten-free all-purpose flour blend! Old-fashioned oats. Quick-cooking oats or rolled oats work well in this recipe too! You can also just substitute 1 cup of oat flour for the ground up oats! Vanilla Greek yogurt. Any type of yogurt, Greek or not, will work in this recipe. Just remember if you choose a plain variety (with no sweetener/sugar), the recipe turns out less sweet, so you might want to increase the brown sugar. Dairy-free yogurts work really well too! Butter. I personally love the taste of butter in this recipe, and there are only 2 TBS! However, for a dairy-free version use coconut oil or ghee! Brown Sugar. For a refined sugar-free version use coconut sugar instead of brown sugar! Unsweetened applesauce. Any type of applesauce works well in this recipe! You can also substitute 1/2 cup mashed banana for the applesauce! 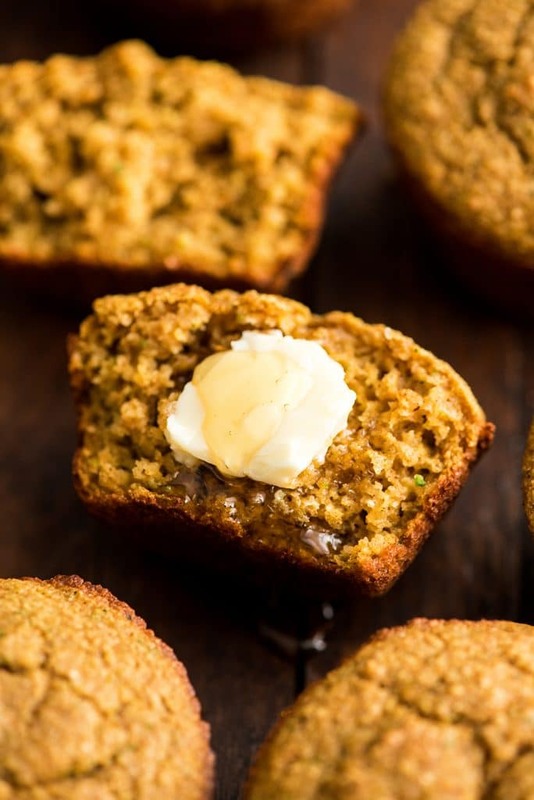 These Carrot Zucchini Muffins are made with whole wheat flour and oatmeal! They are the perfect healthy breakfast recipe that's loaded with nutrition! AKA: Baby Muffins! Place old fashioned oats in the container of your food processor or blender. Blend on high until they reach the consistency of flour (15-30 seconds). Transfer oat flour from the container to a medium bowl. Add whole wheat flour, cinnamon, salt, baking soda and baking powder to the oat flour. Stir to combine and set aside. Put zucchini and carrot into the container of your food processor or blender. Process/blend until they are well chopped/minced into very small pieces. Add Greek yogurt, butter, applesauce and brown sugar and process/blend until smooth. Add eggs and vanilla and pulse to combine. Add dry ingredients to the wet ingredients and blend until combined. Pour ¼ cup portions of batter into each well of the prepared muffin tin. Bake for 18 minutes or until a toothpick comes out clean. How we to teach our kids to make healthy food choices! Ok, now here are just a few things we do to teach our kids the importance of eating healthy foods. However, I wanted to start with one thing we have chosen NOT to do…we will NOT make food a battle. There will be many other, far more worthy, battles worth fighting in our lifetime as parents, and we have decided that eating is not one of them. So our magic phrase is, “you don’t have to eat it.” But the caveat is that if they don’t eat their meal, they don’t get dessert (which we enjoy mostly every night). Don’t like dinner tonight? No problem…don’t eat it. But we don’t allow them to eat until breakfast the next morning. And if we decide that their choice not to eat was purely defiant, then sometimes we save their uneaten dinner and give it to them for breakfast! Always say yes to vegetables. Our kids’ eating habits are unpredictable. They can be ravenous one day and eat practically nothing the next. So on days when they are particularly famished, we tell them they can choose a veggie from the fridge to snack on. Their favorites include baby carrots, cucumbers, and cherry tomatoes, so I make sure to always have plenty on hand! Serve fruit and vegetables at every meal. I have learned that I am the only one in my family who prefers my vegetables cooked (including Ritch). So every mealtime I cut up a giant plate of raw veggies and set out a bowl of whatever fruit we have on hand. Then I let the kids choose their veggies for the meal. Serve veggies BEFORE dinner. Around 4 PM my kids all wake up from their naps and finish their rest time, this is when I start cooking dinner. I always put out a plate of cucumbers, carrots, tomatoes, etc. for them to snack on while they help me. Then if they eat their fair share I don’t even have to think about their vegetable intake during dinner! Teach them to eat their veggies first during mealtime. Sometimes they get full before they finish what is on their plate. We don’t make our kids clean their plates at every meal. I mean, sometimes I accidentally serve them too much! However, they all know that they need to start with their veggies, because that’s more important to finish than…say…their piece of pizza! Teach them the difference between a snack and a treat. This has been really helpful for me. A snack is a healthy food (fruit, vegetables, nuts, cheese, sometimes a protein bar, yogurt, etc.). A treat is something like candy, cookies, cake, chips etc. Then when they ask for a piece of candy for a snack, I remind them that candy falls in the “treat” category, and to try again! Use Sneaky Veggies! For the days that you know will be indulgent or you just don’t feel like thinking about getting your kids to eat vegetables…make recipes that taste delicious but are loaded with sneaky veggies…like these Carrot Zucchini Muffins! Some other ideas are: spinach banana muffins, chocolate peanut butter green smoothie, paleo zucchini muffins, double chocolate zucchini bread, and the list goes on and on! Finally, remember food is to be enjoyed. You can still feed your kids healthy meals that they LOVE! Try blending zucchini into your pizza sauce and make your own pizza dough! make a lightened-up version of mac & cheese, and don’t forget a generous dollop of guacamole on taco night! Please check out these other recipes by amazing bloggers who are also promoting the mission of World Vision! my sons allergic to eggs what would you suggest to use instead? Hi Michelle, I’m not affiliated with this website at all – just a fellow cook here. I have successfully used the following egg substitutes in my baking: (1 Tbsp flax meal + 3 Tbsp water, mix and let sit for 10 min); (1 Tbsp chia seeds + 3 Tbsp water, mix and let sit for 10 min); (1/2 a mashed banana). Hope that helps! I’ve made these a bunch of times and have substituted maple syrup for the brown sugar each time. And I used plain greek yogurt since we always have it in the fridge. My 2 year old LOVES them!